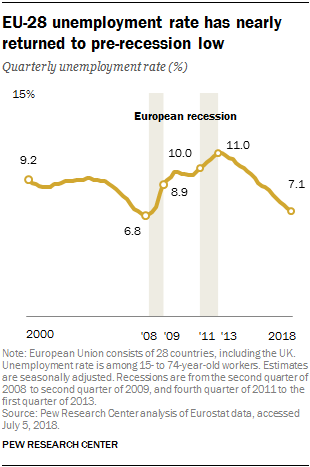 The European Union’s unemployment rate has dropped to its lowest point in almost a decade, though joblessness still varies widely among the 28 countries that make up the bloc, according to a Pew Research Center analysis of data from Eurostat, Europe’s statistical agency. The EU unemployment rate was 7.1% in the first quarter of 2018, the most recent quarter for which data for all countries are available. That was nearly on par with the 6.8% rate recorded in the first quarter of 2008, before the European financial crisis began. Europe’s unemployment rate reached a recent high of 11% in the first and second quarters of 2013. The steady decline since then reflects steady economic improvement in many EU countries. Europe’s overall unemployment rate fluctuated during the EU financial crisis, which spanned two recessions. 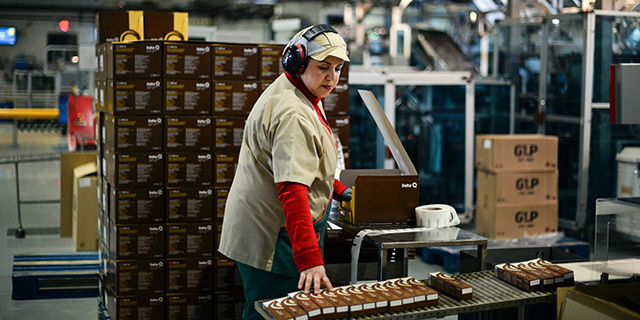 Unemployment steadily increased as economic output fell during the first recession, which lasted from the second quarter of 2008 to the second quarter of 2009. Unemployment then continued to increase while output stayed flat through the second recession, which lasted from the fourth quarter of 2011 to the first quarter of 2013. Although output grew in the roughly two years between the recessions, unemployment still trended up during this period. Explore our interactive on unemployment rates in the 28 countries that make up the European Union. As Europe’s overall unemployment rate has returned to pre-recession levels, public optimism about the economy has increased in some of the bloc’s countries. In fall 2017, for example, 85% of Germans said the economic situation in their country was very or somewhat good. That was up from 2007, when 63% said the same, according to Pew Research Center surveys. But public opinion about the economy has not improved everywhere. In Spain, where unemployment remains high despite dropping in recent years, just 28% of adults gave the economy a positive grade in fall 2017, down from 65% in 2007. In the United Kingdom, 41% said that their national economy was good, down from 69% in 2007, even though the British unemployment rate is relatively low and has steadily decreased since the financial crisis ended. The Greek public, meanwhile, continued to give its country’s economy an extremely low rating in a spring 2017 survey, reflecting Greece’s persistently high unemployment rate. Almost all Greeks (98%) said the country’s economic situation was somewhat or very bad in 2017, unchanged from the share in 2012 that said the same (the first time the question was asked). Unemployment varies widely by country in the EU, in many cases reflecting national differences in economic performance. In the first quarter of 2018, the Czech Republic, Germany, Hungary and Poland had the lowest unemployment rates, while Greece, Spain, Italy, Croatia and Cyprus had the highest. Nearly all EU countries’ unemployment rates declined from the first quarter of 2013 – the end of Europe’s second recession – to the first quarter of 2018, but the degree of change differed starkly between nations. The countries with the largest percentage-point decreases include Spain (-10.0 percentage points), Portugal (-9.7) and Ireland (-8.7), while unemployment decreased far more modestly in Austria (-0.3 points), Luxembourg (-0.3), Italy (-0.8) and France (-1.1). Only Finland (+0.1) saw an increase during this time. Europe’s economic downturns also affected countries’ unemployment at different times. Germany’s unemployment rate peaked at 11.2% before the crisis, in the second and third quarters of 2005, and then declined from 2008 to 2018. In Greece, unemployment climbed to 27.7% in the second and third quarter of 2013, the highest unemployment rate an EU country has seen over the past two decades. By contrast, in the UK, unemployment never reached double digits, peaking at 8.4% in the fourth quarter of 2011. Youth unemployment in the EU has also dropped to pre-recession levels. At the beginning of 2018, the unemployment rate among workers ages 15 to 24 (15.6%) was the same as at the start of the recession in the second quarter of 2008. However, youth unemployment remains high in parts of Europe. As of the first quarter of 2018, at least a quarter of workers ages 15 to 24 were unemployed in Greece (43.8%), Spain (35.5%), Italy (32.5%) and Croatia (23.6%). Germany (6.3%), the Czech Republic (6.9%) and the Netherlands (7.2%) had the EU’s lowest youth unemployment rates.